When you start tracking time with Clockify, you'll have real data that shows you exactly where your time goes so you can see improve your productivity. When you begin working on something, just type what you're working on and start the timer. When you finish, stop the timer and Clockify will save the time entry. At the end of the day, you can run a report and get an objective look at your business in one easy-to-scan chart. And at the end of the month, you'll be able to analyze every week, identify time-drains, and improve efficiency. 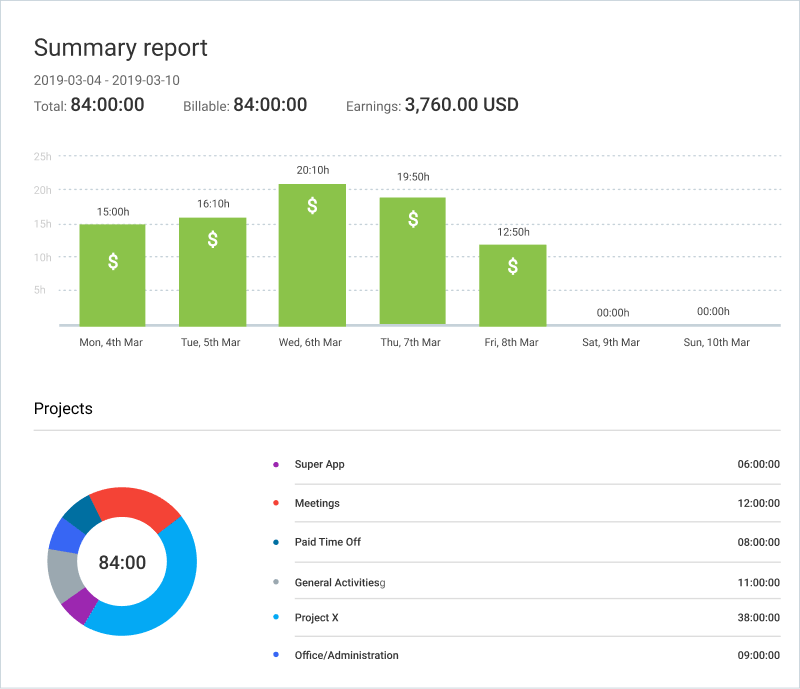 Reports show you time breakdown for each project (as well as how much money you've earned). ✓Am I spending too much time on emails? ✓What sort of work takes up most of my time? ✓How can I spend more time on important/profitable tasks? ✓What jobs can I delegate or forego? ✓How much time will a new project take, based on past data? Whether you bill by the hour or charge a flat rate, Clockify can help you see how profitable your projects are and whether you should increase your hourly rate. First, mark time entries as billable or unbillable, and allocate them to projects. 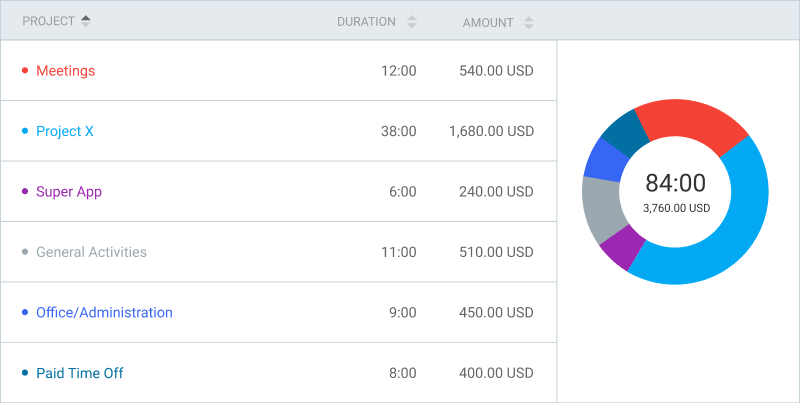 Then, run a report in Clockify that will break down all the time entries by project and client so you can see how profitable your week was. Reports show you billable vs non-billable time across the whole week. What often happens when you do client work is that you spend a lot of time on unbillable activities (like phone calls, commute, feedback), which in turn lowers your real hourly rate. If your real hourly rate is too low, you'll know it's time to either raise your prices or limit the scope of your work. Also, once you know your real hourly rate, you can answer the most important question: “Was that project really worth the hassle?”. Project status shows your project progress and estimated vs tracked time. If you can't show your clients where your every minute (and their dollar) went, you'll have trouble gaining their trust. 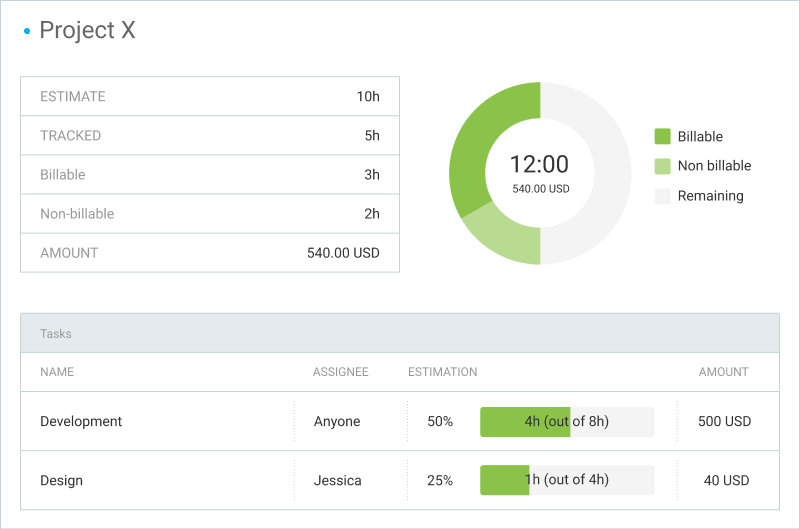 Clockify lets you show your clients a detailed breakdown of all your time so you can bill them easier. Mark each time record as billable or unbillable. Then, when the time comes to issue an invoice, simply run a report in Clockify, filter by time period/project/billability, and download the results in PDF or Excel. You can also share and print the report, give it to your accountant, import data into some invoicing software, or send a link to the online report to your client so they can monitor how much you work in real time. You can export a report as PDF and send it to your client. Or, you can use the data in it as a basis for creating an invoice. No matter if you have just an assistant or manage a big team, you need to know what your team worked on and how much. Invite your whole team to Clockify so they can log the time they spend on tasks, customers, and internal projects. Unlike other time trackers, Clockify lets you have unlimited users, for free. 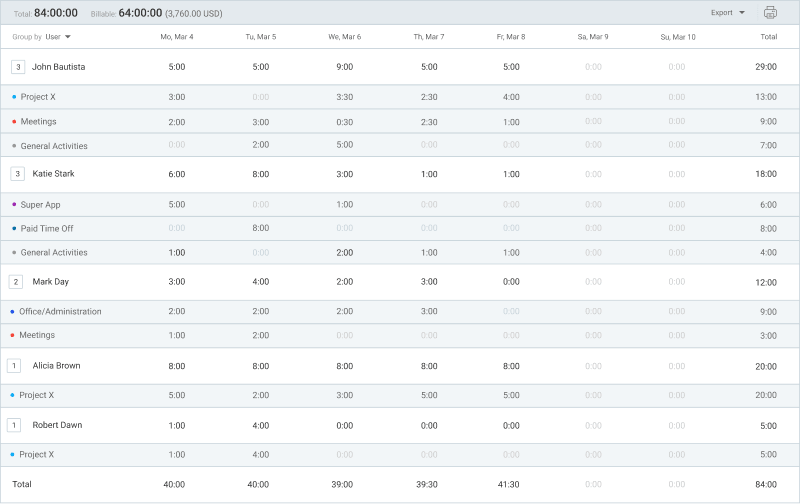 As your team tracks time, you can see what they worked on and how much in a report. When the time comes for payroll, just run the report to see how much you need to pay them. Weekly report shows you how much time each team member tracked during the week. We needed a better way to keep track of everyone's time, projects, and budgets in one place. Enter, Toggl! It seemed like a dream come true except... you had to pay per month and per person! There was no way our little company could afford that. As a company just starting to get off the ground, we need every penny we can spare and a good way to track our employees' hours and project investments. Now that Clockify timesheet app is available, I have even higher hopes for our company's success this year. I love Clockify. It's easy to use, keeps time tracking simple and sensible, and doesn't offer me a lot of extra stuff that I don't want. It doesn't pressure me to buy anything, and it doesn't have the most useful features locked behind the paywall. When you just want a simple time tracker to keep track of the time you're spending on various tasks, Clockify is the way to go. I've never had a single problem with Clockify, compared to other software I've tried that made things way too complicated.